The Flannan Isles lie to the west of the Isle of Lewis in the Outer Hebrides. 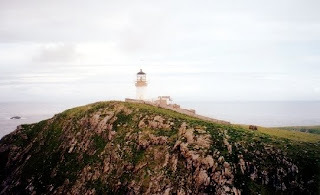 They have been uninhabited since the lighthouse on Eilean Mór was automated in 1971, having operated since December 1899. Just a little over a year after it first opened something rather unsettling occurred. In Mid-December 1900, three lighthouse keepers, Thomas Marshal, James Ducat and Donald Macarthur, were stationed there. Macarthur was standing in for a, soon to be rather lucky, assistant keeper who was on long term sick leave. There were actually four keepers, Joseph Moore being the fourth, each one taking it in turns to have a fortnight's break and then coming back to relieve one of the others. Moore had left the island on the 7th December. It would turn out that he was to be the last person to see the others ever again. The first sign of anything amiss occurred on the night of the 15th December. Sometime around midnight the American steamer, Archtor, passed by. Thankfully the look out spotted the land, for the lighthouse was dark. Captain Holman reported this upon reaching port but his report does not seem to have reached the Northern Lighthouse Board. However it was soon noticed from the Isle of Lewis. Moore was due to return on the 20th December but bad weather meant he and the tender Hesperus weren't able to reach the island until Boxing Day. Moore's report upon landing is as follows. Captain Harvie deemed it prudent to lower a boat and land a man if it was possible. I was the first to land, leaving Mr McCormick, the Buoymaster, and the men in the boat till I could return. I went up to the lighthouse and on coming to the entrance gate I found it closed. I made for the entrance door leading to the kitchen and storeroom and found it also closed, and the door inside that. But the kitchen door itself was open. On entering I looked at the fireplace and saw that the fire was not lighted for some days. I entered the rooms in succession and found the beds empty, just as they left them in the early morning. I did not take time to search further, for I naturally well knew that something serious had occurred. I darted outside and made for the landing. I informed Mr McCormick that the place was deserted. He with some men came up so as to make sure, but unfortunately the first impression was only too true. Mr McCormick and myself proceeded to the light room, where everything was in proper order. The lamp was clean, the foundation full, blinds on the windows, etc. He proceeded down to the western landing place (not where he had landed) and found signs of a great deal of storm damage with a box of landing ropes that had been shoved into a deep crevasse missing. One, these log entries would, if true, but rather disturbing. But secondly I think we can all agree that they seem highly suspect. Other details often included are that the kitchen was left in quite a state with a breakfast half eaten (hello Mary Celeste rumours!) and a chair overturned suggesting some sort of flight or rush had occurred. Finally, mentioned often, are the three sets of oilskins. Two were found missing with one left on the peg suggesting that the last member of the three had left the lighthouse in a great rush, as who would go out into the December air on an isolated Scottish island in just their shirt?? Well the log is almost certainly a forgery (investigations at the time state the log was only completed up to the 13th with a final two entries written up on a chalk board ready to be transcribed. Nothing unusual was reported about those entries. On the Thursday and Friday the men made a thorough search over and round the island and I went over the ground with them on the Saturday. Everything at the East landing place was in order... and the lighthouse buildings and everything at the Station was in order. Owing to the amount of sea, I could not get down to the [west] landing place, but I got down to the crane platform about 70 feet above the sea level... The crane... was found to be unharmed, the jib lowered and secured to the rock, and the canvas covering the wire rope on the barrel securely lashed around it, and there was no evidence that the men had been doing anything at the crane. The mooring ropes, landing ropes, derrick landing ropes and crane handles, and also a wooden box in which they were kept and which was secured in a crevice in the rooks 70 feet up the tramway... were displaced and twisted. A large block of stone, weighing upwards of 20 cwt., had been dislodged from its position higher up and carried down and left on the concrete path leading from the terminus of the railway to the top of the steps. A life buoy fastened to the railing along this path, to be used in case of emergency, had disappeared, and I thought at first it had been removed for the purpose of being used but, on examining the ropes by which it was fastened, I found that they had not been touched, and as pieces of canvas were adhering to the ropes, it was evident that the force of the sea pouring through the railings had, even at this great height (110 feet above sea level), torn the life buoy off the ropes. So perhaps murder could be ruled out. The final decision of the investigation was that Thomas Marshal and James Ducat had gone out in a storm on the 15th of December 1900 in a heroic effort to save the mooring ropes on the western dock. Donald Macarthur, whose coat had been the one left on the peg, must have gone to their aid in a hurry after they got into trouble and all three of them were washed out to sea. Of course the report was met with disbelief especially considering the extremely large height given for tidal damage. 110 feet tall waves?? Well, as we now know, such large waves are rare but quite possible. And the lay of the land on the island was such that a later keeper investigating the disappearances was nearly washed off a cliff at 200 feet! There is a great article here specifying more details of what happened, and what didn't, here.